1 The UK and the EU: How did we get to Brexit? 2. 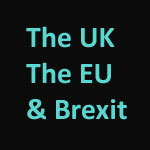 Brexit- the process: Article 50 of the Treaty on European Union; the institutions involved in Brexit.